I should know better than to judge a book by its cover, but sometimes the album art grabs my attention and sets my expectations for the music. 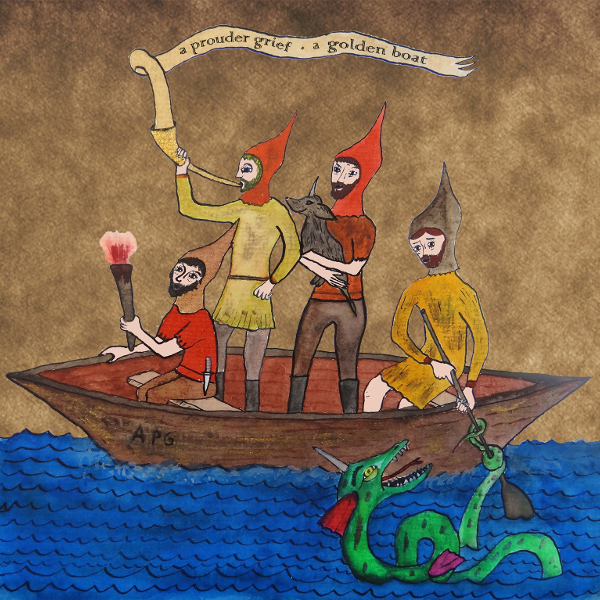 So with the medieval cover art of A Golden Boat, I was expecting to hear something like Gryphon. Boy was I surprised! Instead of courtly music played on vintage instruments, Germany’s A Prouder Grief delivers four solid and serene instrumental tracks that move between progressive rock, jazz fusion, and the psychedelic jamming of Godspeed You! Black Emperor. Taking direction from Manuel Göttsching’s Inventions for Electric Guitar, A Prouder Grief builds rhythmic guitar sequences that provide the foundation for soaring violin and electric guitar excursions. The four tracks are built on simple motifs that the musicians trade back and forth, at times adding complexity to the tracks. The slowly building and evolving nature of the tracks reminds me of Proud Peasant’s debut album from 2014 Flight. The final track is a mouthful “Und niemand kann von der stirne mir nehmen den traurigen traum,” German for “And no one can take away from me the sad dream.” Over the course of nearly 17 minutes, A Prouder Grief builds to many false climaxes and then fades away to delicate church organ or piano interludes. The release is sure to please all fans of soothing instrumental rock.